Dorner will be exhibiting at PACK EXPO 2017 from September 25-27 in Las Vegas, NV. Before you see us in person in Booth C-1444, we’re giving you a sneak peek of the displays we’ll have running. Last year we premiered our new packaging loop at PACK EXPO in Chicago, IL and this year we’re bringing it to Las Vegas! The new display contains six conveyors and demonstrates the many different ways to handle the relatively small product. The loop includes two SmartFlex® conveyors outfitted with FlexMove®Technology, a 2200 Series nose-over squeeze, a 3200 Series bottomless squeezing conveyor; and two 3200 Series conveyors with Activated Roller Belt™ (ARB™) Technology, which is a patent-protected technology of Intralox. The SmartFlex Twist uses two SmartFlex Conveyors with FlexMove technology to turn a product 90°. See a case handling application where we used a SmartFlex Twist here. The 2200 Series nose-over squeeze is a pacing conveyor featuring a FlexMove common mount. 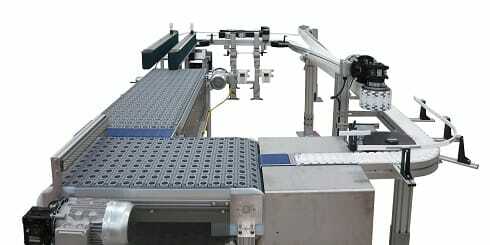 These conveyors run slower than the mainline SmartFlex and provide a gap between products. The final portion of the loop features a 3200 Series bottomless squeezing conveyor. The bottomless conveyor design gives access to the underside of packages for processes such as taping, labeling and/or inspection without the need to turn the product. The 3200 Series Precision Move display shows the fast and accurate belt movement of Dorner’s Precision Move conveyors. They are ideal for applications that require precision and repeatability of product movement. Still need to register? Register for free by entering Dorner’s Comp Code: 93M15.